The big question going into Neeraj Pandey’s M.S. Dhoni: An Untold Story was – why? Why does it exist? Given the sheer number of articles, think pieces and news reports that come out annually on the Indian cricket captain, who found his feet just as India became a nation addicted to social media shenanigans and hysterical yellow journalism, what exactly had its creators found that compelled them to make this movie? The movie opened on a hopeful note for this reviewer as Pandey brought in several threads from Dhoni’s life – not all of them untold, but perhaps not previously narrated in a cohesive whole. There was the tension of being an Indian child with unconventional tastes (he’d rather play football than cricket! ); the burden of meeting parental expectations, particularly that of the strict but loving, hardworking, lower-middle class father who carries the unspecified weight of the world on his shoulders; that now-famous rewriting of conventional wisdom that allowed Indian cricket to shift focus to the untapped talent languishing in “B-tier towns”; the tragicomedy of dealing with Indian bureaucracy; falling in love at inconvenient times and dealing with loss; the politicking that comes with power and position, etc. Every item on a checklist had been ticked off. In fact, there were so many possible narrative threads set up in the first half of the movie, it was quite a puzzle how they would all come together in the second. And the sad answer was that all this rich texture simply existed to bring our attention to different parts of Dhoni’s flawless character. He is benevolent to the bureaucrats who nearly destroyed his career! He remembers his old friends even though he has learned better grooming and improved his English! He even has a friend whose possible alcoholism only exists to underline the fact that Dhoni himself would never touch terrible, soul-destroying things like beer because his body is a temple dedicated to sport. The much-touted story of the woman he loved and lost fades into a larger theme of his being a man beholden to second chances from life. Part of the problem lies in the performance turned in by Sushant Singh Rajput in the eponymous role. Singh is a fine actor whom we have seen perform to better advantage elsewhere – here, he plays Dhoni as next to catatonic when trying to portray him as a reserved man with a rich interior life and terrifying focus. Most of the blame, however, rests on the shoulders of Pandey as the man who wrote and directed this movie, for trying to shoehorn a living, breathing man into a template more familiar to him. For M.S. Dhoni: An Untold Story ends up telling you a lot more about the man who made it than the man it seeks to portray. Pandey is clearly a man who wants to write thrillers that incorporate the tiny details of everyday life in the less shiny bits of India. The problem with this movie, however, is that it is a thriller in search of a thrill. It can’t be found in the first half of the movie where Dhoni casually bats his way to the top until a mincing/swaggering Yuvraj Singh introduces a bit of tension by outclassing not just him but his entire team of rustics while armed with a pair of headphones. The movie keeps telling the viewer that this is an unconventionally cerebral man who has felt the pain of struggle and loss, but from the very first frame where an intensely focused Dhoni walks out to the gladiator’s ring that Indians like to call a cricket field, there is no doubt in anybody’s mind that this man is going to excel. His friends believe so strongly in him, they don’t think twice about bugging acquaintances to sponsor him; amazing opportunities continuously come his way without his ever having applied for them; when he’s stuck at a dead-end job, his boss encourages him to play truant and concentrate on his game. How is one supposed to feel sorry for this guy? As for the emotional loss of his girlfriend, by trying to check that off the list, all Pandey manages to do is to turn her death into a teachable moment for Dhoni, shadowing his relationship with his future wife Sakshi. Both women exist without much context or personality, unlike the rest of Pandey’s dependable troupe of character actors who show up in this film to enact various roles such as cricket commentators and early mentors without making the kind of impact they did in earlier Pandey movies. Finally, however, one does receive an answer as to why this movie was made – so that Indians may celebrate their 2011 World Cup once again. If you’re in the mood for a hagiography of India’s arguably most successful cricket captain, this movie is definitely for you. If you are looking for a competently made movie from a director whose movies have dependably entertained you in the past, like yours truly, you may walk out disappointed. M.S. 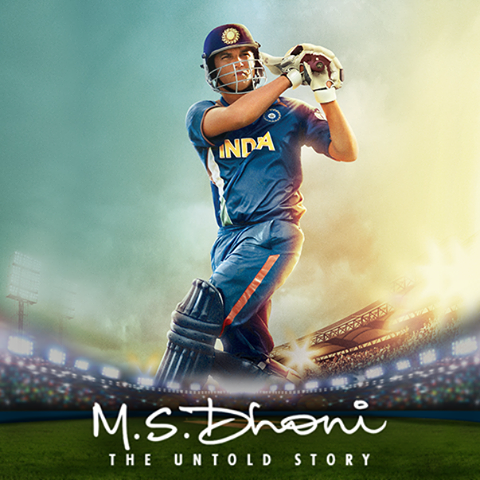 Dhoni: The Untold Story is in theaters now!